2 - 4.............Palma von Ellendonk. 2 - 4.............Jago von Beelen. 1990: 0-0-8 = 8 points (86th). 1987: 96-94-98 = 288 points (1st). 1986: 97-94-95 = 286 points (1st). 1990: 96-94-95 = 285 points (2nd). Bonni vom Nettetal was the winner of the D.V. Meisterschaft in 1986 and 1987. He also passed the Körung 'for life' with highest rating for hardness and working drives. Bonni passed away in 1991 at 9 years of age while his sire, Bingo von Ellendonk, lived to 10 years of age. 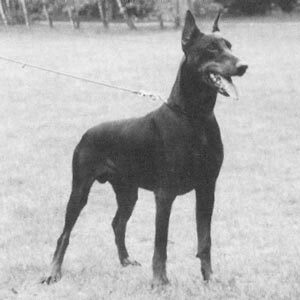 Bonni was later sold to Spain where he managed to win the D.C.E (Dobermann Club de España) Meisterschaft in 1989. In 1990, he placed second in the working Championship of Spain for all-breeds with a score of 285 points. In the same year Bonni participated for Spain at the F.C.I. IPO World Championship in Denmark. Bonni's sire, Bingo von Ellendonk, was the winner of the D.V. Meisterschaft in 1977 and passed the Körung 'for life' with highest rating for hardness and working drives while his dam, Anuk vom Nettetal, was the winner of the D.V. Meisterschaft in 1985. Magalice: SchH 3, FH and dam of the van de Kusthoeve “O, T” litter (Onan, Tall, Titan). Miska: IPO 3 and dam of the van het Weillerland “Q, S” litters.